Jasmine has always had a love for dogs all her life. 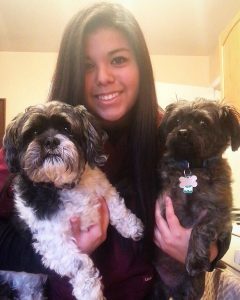 She has two Shih Tzu mixes of her own, Jasper and Chewy. She is currently attending Waubonsee Community College before heading to Northern Illinois University to fulfill a degree in psychology. She also works at Tails Humane Society as well. When not at school or work, Jasmine enjoys playing video games, drawing, painting, and listening to metal music.